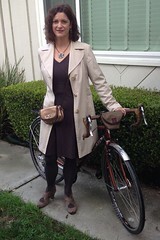 Fashion Friday: Extra Style for Extra Mama Cycling | One woman. Many bicycles. When your title is “stay at home mom” but there’s little staying at home about the job, you need a style that can take you from school pickup to the grocery store to the playground du jour in parks all over town. 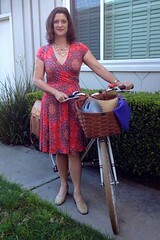 In a peasant blouse, tank top and full skirt, Cherie makes it all look easy on her long-tail family bike. 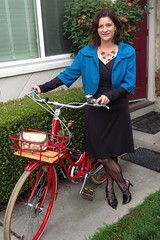 Cherie lives with her husband and two lovely children across the expressway from downtown Mountain View. Sporty sandals are fine for the easy trips. For bigger loads on hillier routes, Cherie flips the pedals and clips in. A rock climbing tank means no-sweat comfort even in midday heat, while a breezy peasant top adds flair. Talk about having full range of motion! 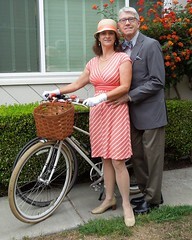 The gores in her godet skirt add width, volume, swing and kick. 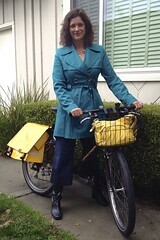 Pingback: Bike Spotting: Electric-Assist Urban Arrow Cargo Bike | One woman. Many bicycles. I am so glad to have happened upon this post! We are currently a car-free family living in Chicago and just got word that we’ll be relocating to Cupertino. While I fully expect that we will have a car while living in CA, I am also glad to see that there are at least a few family cyclists out and about. We haven’t decided exactly where we’ll land, so if you have any input on the most family-cycling friendly places around about Cupertino I’m all ears! Thanks so much! Hi Danielle, I’m so sorry I forgot to respond to you earlier. 😦 Cherie and I both live in Mountain View, about 6 miles from Cupertino. Cherie’s husband works at Apple and takes one of their shuttle buses from downtown Mountain View every day. Have you learned more in the last two weeks about our area? I can answer specific questions. As a new bicycle enthusiast and a mom riding in Northern Minnesota functional fashion is always the forefront of our limited fashionable selections. 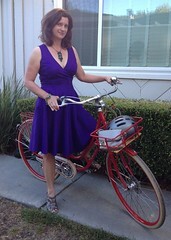 But I feel as a cyclist its even more limited I’m so happy to see moms rocking functional fashion on the bike trails :D! A wonderful post to see. Northern Minnesota must have some severe weather challenges. I wear knee high boots almost all winter to deal with our chill. I’m sure your boots are much more insulated! 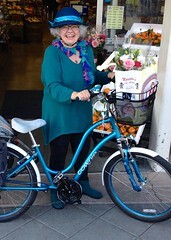 I was actually inspired a lot by Dottie of Let’s Go Ride a Bike. I love her posts about her clothing selections to combat the cold Chicago winters. Like ski goggles. Never would have thought of that.